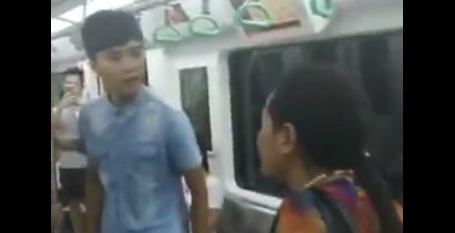 Gay marriage proposal on the subway of Chengdu, China attracts violent response from observer. A marriage proposal between two men in the Chinese city of Chengdu was met with a physical assault by a female observer, according to the Global Times. In a 82-second clip uploaded to social media, one man with a bouquet of roses is seen kneeling in font of another in a proprosal of marriage. The happy moment is cut short, however, when a middle-owan takes objection to the display of affection and attacks the couples' friend who defends their actions. not her business... love is love she is ignorant and self centered. sad to see this. Tis sad that this moment was crushed by someone is ignorant and totally out of line. Guess she doesn't understand what 'love' is . . . This is China.... They involve themselves in everyone elses business but their own and it will not change anytime soon. Blatant ignorance and uneducated bigotry.